Copper has long been sued for the production of coins throughout the recorded history of the earth. It is also used in making vats, cooking utensils and ornamental objects among others. Copper at one point in time used to a great extent in sheathing the bottom of wooden ships and prevent flooding in the process. The metal can be easily electroplated either in its own or as a base for many other metals. Large quantities of the metal are used for the aforementioned purpose, specifically in making electrotypes (reproductions of type for printing). The metallurgy of copper differs with the specific constitution of the ores from which it was taken from. Native copper is usually crushed, washed and then casted in bars. Carbonates and oxides are then reduced with the use of carbon. The sulfides, which are considered as the most significant ores contain a little as 1 percent up to around 12 percent or less of copper. These ores must first be crushed and condensed through the process of flotation. The concentrates are then collected and smelted in a reverberatory furnace which holds crude metallic copper that are estimated 98 percent pure. Crude copper is purified further via the process of electrolysis which produces copper bars that exceeds 99.9 percent purity. Pure copper is soft; nonetheless it can be considerably hardened by being worked or by being combined with other metals. Alloys of copper are much stronger and harder when compared to the pure metal. They also have a higher resistance which means that they cannot be used for electrical purposes. However, copper alloys have a high amount of resistance to corrosion which is almost as high as that of pure copper and are very easily worked and manipulated in machine shops. The two most significant copper alloys are bronze (copper and tin) and brass (copper and zinc). Both tin and zinc are sometimes mixed in to the same alloy; in addition there are no significant distinctions between bronze and brass. Both alloys are used in great quantities. Copper can also be combined with gold, silver and nickel and is an important component of alloys such as gunmetal, Monel metal and German silver. Certain copper solutions are used in the manufacturing of rayon. 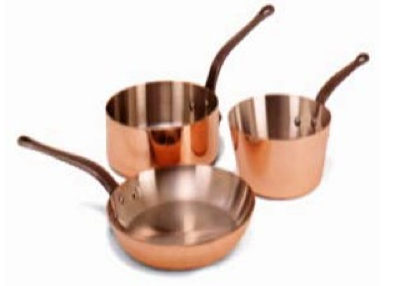 Copper can also be used in making pigments and coloring.